Excavation of Experimental Kilns | Harray Potter Ltd. In September 2008 the existing kiln was reconstructed in readiness for a further firing. The turf-built structure (c.1.2m internal diameter x 1m height) was originally constructed in 2007 and had already seen two successful firings (August 2007 and May 2008). The inner wall had, however, become severely heat damaged, much of which damage occurred during the second firing. This had resulted in a partial collapse of the upper wall levels on the north- and west-facing sides. Elsewhere around the circuit, again particularly on the western side, the c.0.6m-thick wall had more or less completely burned through in places. The reconstruction work afforded an opportunity to excavate the accumulated ash deposits within the firing chamber. The fuels used in the two firings were different. In the August 2007 experiment, peat mould was the only material used. Following the firing, the fuel ash lay undisturbed for just over seven months, and remained in situ for the subsequent firing. The May 2008 fuel consisted of peat mould, cattle dung, and seaweed. A quantity of wood was also used in the later stages of the firing. Both firings achieved a maximum temperature of a little over 1000°C. One further point should be noted: with fewer and smaller pots (91; small- to medium-sized bowls and beakers) available for the 2008 firing, the size of the firing chamber was reduced by the insertion of a stacked turf-block partition wall, which ran parallel to the original south-facing circuit. Resting on the ash deposits from the previous firing, this wall was c.0.4m in width x 0.6m in height, and resulted in the creation of an oval firing chamber measuring c.1.2m E-W x 0.8m N-S.
Half-sectioning of the ash deposits, which had an overall maximum thickness of 0.62m, revealed a clear history of use, with the two firing episodes unambiguously differentiated. The (un-excavated) base of the firing chamber consisted of a hard, compressed, light brown to light grey layer, with light pink tinges and occasional dense black areas. The surface also contained many small- and medium-sized pieces of sandstone, naturally occurring in the clayey subsoil on which the kiln was built, which had become burnt or scorched during the firing. 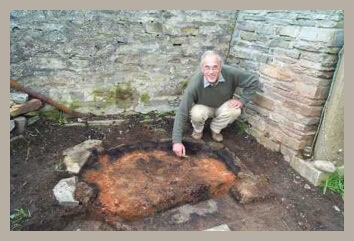 An homogenous dense black stain, embedded with pockets of carbonised vegetation (stems and roots), circled the outer edge of base, abutting the surviving turf wall. It varied between 0.15-0.3m in width, had an irregular inner edge, and was observed running up through the ash deposits. This is interpreted as the footprint of that part of the kiln’s perimeter turf wall destroyed by heat penetration during the firing process. 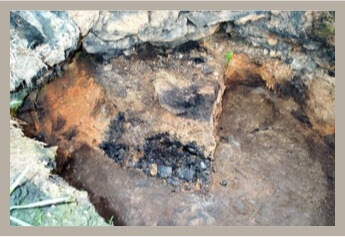 Resting on the base of the firing chamber was an intermittent spread, dense in places, of charcoal and charred wood, which represented the remains of the fire used to begin the fuel ignition process for the August 2007 firing. Mixed with, and covering this, was a loosely compressed and largely undifferentiated dull reddish-brown to orange layer of peat ash, between 0.15-0.2m in thickness. 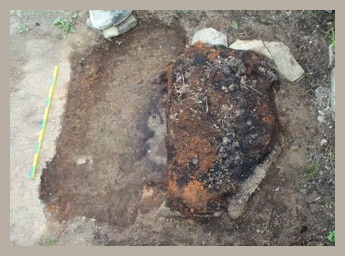 This deposit, representing the spent fuel residue from the 2007 experiment, also contained numerous flecks of charcoal and the occasional piece of charred wood, as well as fragments of pottery from vessels that failed to survive the firing. 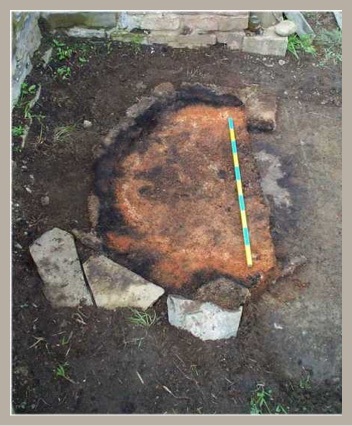 Sealing this was a thin layer, between 2 and 4cm in thickness, of loose, light grey to light brown loamy material, thickest at the interface between the kiln wall and ash deposit, the upper surface of which showed considerable evidence of burning. Effectively a weathered surface that accumulated in the seven or so month interval between the first and second firings, it consisted of eroded soil and tumble from the kiln wall, and represented a clearly defined chronological marker in the history of the kiln’s use. The deposits above the weathered surface all related to the May 2008 firing. Given the short time gap between firing and excavation, this material, with a maximum thickness of c.0.4m, was altogether looser, fresher and more vibrant in appearance, with many subtle colourations; and, in terms of stratigraphy, it was also much more complex, largely the result of using a wider range of fuel materials. On the northern side of the kiln the ash deposits were contained by the remains of the turf wall, which had been constructed in order to reduce the size of the firing chamber. This wall, built directly on the underlying weathered surface, had been completely consumed during the firing and survived only as a well defined bank of crumbly light orange loamy soil; no individual turf blocks could be identified, except at the base of the wall. The inner edge of the bank (that is, kiln side) was near vertical in profile, but the outer edge had slumped at an angle of around 25º from the vertical; further slumping had been prevented by the presence of the original kiln wall on this side. Essentially, the above-described weathered surface provided the kiln base for the second firing. On this, a spread of charcoal and partially consumed wood indicated the seat of the blaze that initiated the firing process. 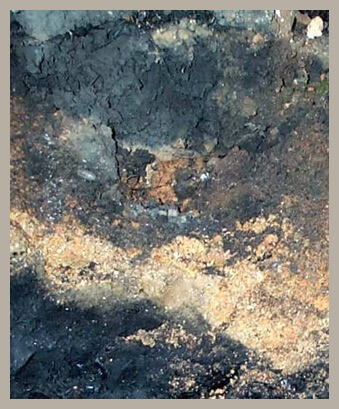 The ash deposits over this comprised a complex sequence of differently coloured and textured lenses, representing the inter-mixing of the different fuels used in the firing: coarse textured browns, reddish-browns, oranges and yellows of the peat mould; fine textured blacks of the seaweed; and the powdery greys and off-whites of the animal dung. The upper levels also contained patches of charcoal and charred wood, the remains of additional fuel used in the latter stages of the firing. Whilst the complexity of the deposit reflected the range of fuels used and the ways in which they were dumped/placed around the pots, it was also, in part, a product of disturbance caused by the lifting of vessels following firing. A range of ‘archaeological’ artefacts and ecofacts were recovered from within the fuel matrix of the August 2007 and May 2008 firing events, all of which could be directly associated with one or other of these episodes of use: five complete vessels (missed during the unloading process); twenty pottery sherds (from seven failed vessels); three fragments of applied ceramic strip decoration, which had become detached from an otherwise successfully fired vessel; six heavily calcined sheep bones (rib and shoulder blades; placed in the kiln as a separate experiment); a quantity of fused and very fragile marine winkle shells (from the seaweed fuel, a remarkable survival given the temperatures achieved); and a number of nails, screws and small metal brackets, these all from the joiner’s off-cuts used as additional fuel. The excavation proved to be an archaeologically informative and interesting exercise. It was possible to excavate a structure whose exact history was known and documented. It was known that the kiln was built in early August 2007 and had been used on two separate occasions for the experimental firing of Neolithic pottery. It was known that the ash from the first firing had been deliberately left in situ and that an interval of seven months had passed between the first and second firings, during which time a weathered surface had developed on the ash deposits relating to the first experiment. It was further known that the second firing took place directly on top of the earlier ash deposits, and that on this occasion the insertion of an inner turf wall on the northern side had reduced the size of the firing chamber. It was interesting to note that the separate use-events could be precisely correlated with the observed archaeological evidence. Even without the above foreknowledge it would have been possible to construct a connected historical narrative and interpretive account of the kiln and its use. All the recovered artefacts could be directly associated with each use episode; the pottery sherds showed none of the typical signs of wasters, but those from the lower ash horizon (firing 1) showed clear evidence of having undergone re-firing. Both the sherds and the complete vessels, in association with large quantities of ash, charcoal and charred wood, and extensive areas of burnt soil, attest the original function of the structure as a pottery kiln. Furthermore, and potentially of great significance, some of the recovered evidence can be paralleled in the archaeological record. 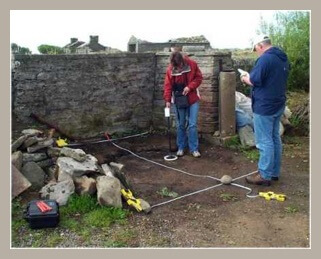 In particular, structural features encountered in 2006 at the Knowes of Trotty, Harray, and interpreted by the excavators as a Neolithic pottery kiln, bear an uncanny resemblance to aspects of the experimental kiln. Attention is likewise drawn to a structure excavated at Allt Chrisal, Barra, in the 1980s, also interpreted as a turf-built Neolithic pottery kiln. However, much more analysis needs to be done on these comparisons before any considered statements can be made.